Top 7 Media Converter for Mac [Users Choice] | Convert Video to Any Format! A talented media converter Mac always plays a great role on your Mac computer since Mac isn't so compatible as Windows PC for various formats. For example, Mac default media player QuickTime excluding AVI, MKV, FLV has been an issue left over by history. What's worse, though you download and install other Mac video players like VLC player, MPlayer, GOM Player, the video playback process is still full of hardship. Some Mac users give feedback on forums that VLC player won't play MKV, VLC plays videos with subtitles/audio out of sync, full screen MPlayer problems, etc. Quite off-putting, right? So, comparatively speaking, you'd better to convert AVI MKV FLV WMV AVCHD 4K video to Mac accepted video MP4 MOV M4V format with the best media file converter for Mac. Thus, you can play any video with Mac default yet far more stable QuickTime player, away from various annoying issues. Better still, you can even sync videos from Mac to iPhone iPad Android for on-the-go playback under the help of best Mac video converter. Millions Users Common Choice to convert video to any video/audio/device. * Convert video to MP4 H264 MOV HEVC MKV AVI MP3, etc within 3 steps. * Convert any video to iPhone Xs/X, iPad, Android, game console, 420+ profiles. * Intel QSV tech to convert and compress video with No.1 fast speed. * Convert SD, HD, Ultra HD 4K/8K video with 98% quality reserved. Faced with multiple choices, most users who have allodoxaphobia would feel trapped in a dilemma, hard to make decision. Who can blame you? There are so many tools whose slogan or ads are almost the same, all boasting themselves as the best one, able to do anything, no matter convert MKV to MP4, MKV to AVI, FLV to MP4, WMV to MOV, or convert 4K to 1080p, MP4 to MP3, etc. But most often, you might get video converted at only 50%, half crashes, or spend 24 hrs to convert and compress video on Mac but end with a output file in poor quality, the picture fuzzy and size all wrong. To avoid these, you're suggested to better take "something" into consideration prior to download a Mac media converter, including its video conversion features, easiness, speed, quality, OS compatibility, price, etc. But which matters most? Below lists four users most concerned elements that make up the best media file converter for Mac. The first criterion to judge a video converter Mac excellent or not is the video conversion feature; whether it supports all videos as input and output formats. Converting video needs to re-encode video, which means quality loss on your output file. The difference lies in how much quality it will lose, a little or a lot. Fast converter will make full use of CPU and GPU hardware acceleration tech to save your conversion time. It lets you tweak parameters to speed up converting, as well. A world-class Mac video converter will not take you more than 1 min to discern how to convert video on Mac, no matter you are an expert or a beginner. Pros: Simple to use, convert video to all the popular video format, super fast speed. Cons: unable to convert audio on Mac. MacX Video Converter Pro is an all-in-one video converter for Mac to convert video, as well as download, compress, edit and record video. It supports to convert any video (SD, HD & UHD) to 180+ video and 14+ audio formats, like convert MKV to MP4, AVI to MP4, MKV to AVI, WMV to MOV, H.265 to H.264, 4K to 1080P, AVCHD to SWF, H264 to H265 so as to play on QuickTime, Mac computer, iTunes, iMovie with 98% quality reserved. Just 3 clicks to compress large video to iPhone Xs Max, iPad Pro, Android, Samsung, Sony, Huawei, game console, etc. for playback with no space/time limits. No worries about the speed, with Intel Quick Sync Video and multi-core CPU utility, it lets you convert video on Mac with 5X faster speed than any other converter. If you wanna keep balance between video file size and video quality, the parameters settings (resolution, frame rate, Bit rate, etc) are available for you to adjust. Wondershare Video Converter Ultimate for Mac have a full range of compatibility, supporting 150+ formats including the newly 4K video formats, standard formats like MOV, MP4, AVI, FLV, MPEG, H.264, H.265 and so on. You can convert media files with this Mac media converter in perfect quality ( even in high-definition or 3D) no missing key frames, redraw issues, or crashes. Besides, Wondershare Video Converter streams your media files on a PC to a smart TV directly or to a standard TV via media streamers like Chromecast, Roku, Apple TV, Xbox 360. 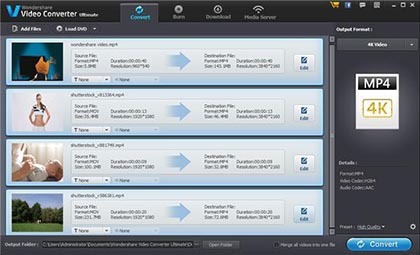 You may be more familiar with WinX HD Video Converter. But its Mac version - WinX HD Video Converter for Mac is fully featured Mac HD video converting software, providing Mac user hassle-free HD video conversion solutions. It converts Blu-ray videos, HDTV/HD-camcorders videos, 4K UHD videos, 1080p multi-track HD videos M2TS, MKV, AVCHD, HDTV, BDAV, MPEG-TS, standard AVI, MPEG, TS, FLV, WMV, OGM, MOV and QT videos, supporting diverse device presets like iPad Pro/Air 2, iPhone 6S/6 (Plus), iTunes, Android etc. This Mac video converter perfectly matches the newest Mac OS X 10.11 El Capitan. Originally, we plan to recommend you Miro Video Converter to convert media files. However, Miro Video Converter is shut down. So we pick out iSkysoft iMedia Converter Deluxe for Mac instead, which is the best all-in-one video converter tool for Mac users on the market, helps you convert videos to any format with simple clicks. To achieve that, you should: Load videos > Edit and Set output format/location > Convert and Share. It converts videos to 150+ video and audio formats and output converted video/audio to any device. And it continues to add new supported formats after the release of new versions! Handbrake is really a wonderful open source media file conversion program for Mac since it's totally free. As an open source and cross-platform video converter for Mac, it accepts most popular video formats as input and output(supported input formats: MKV, AVI, MP4, TS, M2TS, output container formats: MP4, M4V, MKV). The free media converter for Mac OS X works as a good video compressor for Mac and gives us possibility to adjust preset settings, like resolution, bit rate, frame rate, decreasing video quality to compress media file size, trimming, etc. 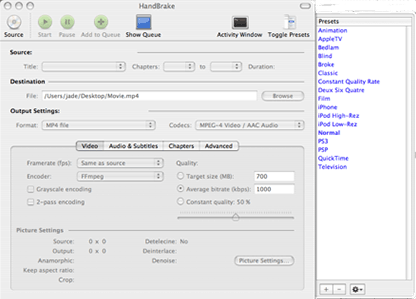 Generally Handbrake works fine as a free media converting software for Mac in converting MP4 to AVI, MKV to MOV, and other widely used formats with acceptable video quality and speed. MacX Video Converter Pro - World's first Mac video converter to support Intel QSV hardware acceleration tech to speed up data conversion 16X faster than before and 5X faster than any rival. Convert video to 180+ video and 14+ audio formats without any quality loss. On top of the aforementioned five video converter for Mac software, here we also list other top two free Mac media converters for those budget-minded users who have no much demanding on multiple features. You can also scoll down and find your favorite. 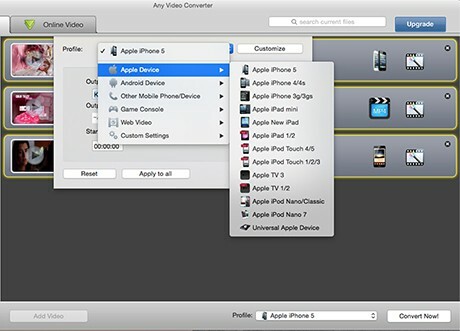 When you open Any Video Converter Free on your Mac computer, you will be greeted with a clean yet user-friendly interface. No further guide, you can immediately know how to use this free video converter Mac to convert video like video to MP4, FLV, AVI, WMV, etc. 13 video and 15 audio formats. And there are also mobile device profiles for you to choose from, including Apple iPhone 5, iPad mini, New iPad, Android, game console, etc. 70 profiles. There are still some basic video editing features. Where this free Mac video converter falls down is that it can't convert video to HD video like MKV, AVCHD, MTS, M2TS, etc. high definition formats. If you don't care about this, this media converter freeware is worth your consideration. Unable to convert video to HD video. No latest mobile device profiles offered. lability in the macOS Sierra OS. The above-mentioned media file converter Mac apps are all needed to download and install. But this one doesn't, cuz it's a web-based online media converter. 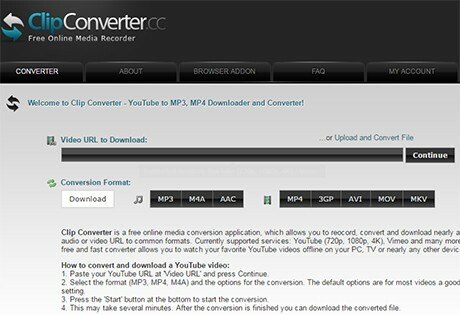 Once you click "Upload and Convert File" option on Clipconverter website, you will be redirected to a website named cloudconvert, where you can convert videos among 200 different video, audio, as well as document, ebook, archive, image, spreadsheet and presentation formats. After file uploading, you can choose MP4, OGG, 3GP, WMV, MKV, AVI, MOV, etc. 15 video and 8 audio formats as output formats. Click "Start Conversion" and then it goes into action. One small drawback is that the conversion procedure is not smooth. It freezes at the conversion of 6%, demanding more patience from users. 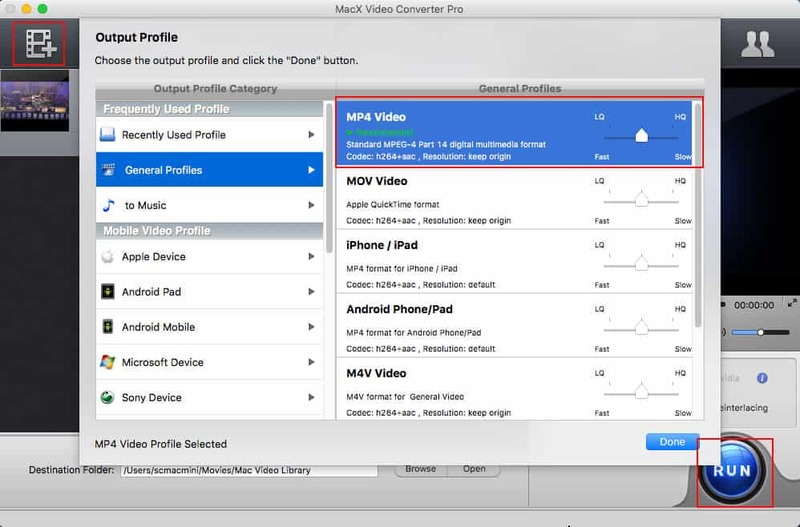 This ProRes converter guide shows you the best ProRes converter for Mac/Win to easily convert Apple ProRes to MP4, AVI, MOV, etc for compatible with iPhone iPad Android or convert video to ProRes for editing with iMovie, Final Cut Pro, etc. If you have high bitrate files, you may want to convert bitrate for MP4, MOV, MKV, MP3 to lower for saving more space on your device. Here the best bitrate converter will show you how to free change audio video bitrate at ease. Looking for MacX Video Converter Pro license code or serial key 2016? This post will introduces 2 safe and official ways to FREE get the serial/license key of the Mac video converter V6.0.2. No more malware or virus. MacX Video Converter Pro, the champion in the review of top media converter for Mac, is the reliable tool for you to convert media files to MP4, MOV, MKV, AVI, FLV, etc. Mac iOS Android supported video formats super fast. [Millions Users Common Choice] Convert What You Feed to What You Need!